Take Your Own Measure: The Ripxx delivers state-of-the-art athletic performance evaluation. The hottest trend in gaming toys is the action equivalent of Bluetooth: automatic motion sensors that catch the action from what you do, so you don’t have to hold any device while you hop around to music or fight someone in Grand Theft Auto. But what if you could use a similar motion-sensing device to capture the details of your speed during a ski run, or your air off a jump on a snowboard? What if you could get an analysis of your body position and pedaling on a road bike to find out in which position you are fastest? Or measurements of what your body is doing in any active sport? 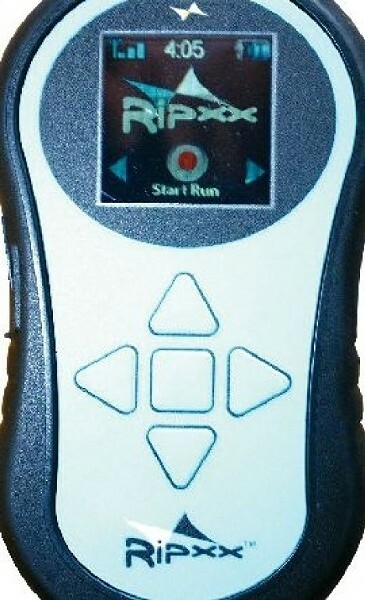 There is such a device—the Ripxx—and it actually helped the U.S. bobsled team win the Olympic gold medal in Vancouver. The Ripxx measures and records 15 different metrics, or details, of your activity in action—which, in playback, will help you to improve where needed. For example, the rotation metric will show if you are making rounder turns in one direction than the other, and the simultaneous speed metric will show whether the rounder turn is faster than a sharper, more Z-shaped turn. Steve Holcomb, driver of the bobsled that won in Vancouver, says that he and his bobsled team all wore a Ripxx. Their coaches analyzed the playback data and were able to tell them the fastest, most efficient way to jump into the sled at the start and the fastest line down the track. The coolest Ripxx metrics are at ski and snowboard resorts. The device works off a GPS that has already loaded every trail at the resort, and in playback, you become an avatar showing each run that you took, whether main groomers, through the trees, in the pipe or the park. Every resort in Utah is available except for Powder Mountain, and the Ripxx folks are currently adding it there. It’s pretty amazing to watch your avatar (a rectangle with a circle on top) go down the mountain while data rolls in the upper-right corner, showing what you did during the run—even when you stopped or slowed down. Everything shows up on the screen, including the black, blue or green trails you cross, the lift towers, even the nearby trees. If you’re familiar with the mountain, you’ll recognize everything. Regardless of the sport you record with the Ripxx, it’s always fascinating to watch the recording of your entire performance in avatar form. You have your choice of four “views”: first person (your point of view), third person (from the side), chase (from behind) and helicopter (from above). You can keep the data and compare it to prior evaluations to see where you’re improving or need to improve. Even climbers can see where they can correct body position to be able to reach better. The device will help anyone become better at their sport. There are only two problems with the Ripxx: First, it can be hard to figure out how to use the device, though the company offers excellent customer support from a real person, in America. The other problem is the price: You have to be a fairly serious athlete to spend $329 to purchase one. But it can also be used by other people, so a coach may wish to get one for a team to use, or a family may want one as a visual souvenir of what they did on an active vacation. The company is now working on a rental program, so you may not even have to purchase a Ripxx. You and a friend could each be able to rent one at a local resort next year, so you won’t have to argue in vain over who went higher or faster; you can actually watch your avatars do it.